Vintage Black Leather Levis 501 Belt. Used - fits up tho 38" waist. Condition is Used. Dispatched with eBay delivery – Shutl 2-3 days. THE JEANS WERE MADE IN BRAZIL AT A LEVIS STRAUSS & CO. OWNED & OPERATED FACILITY OF 100% COTTON DENIM IN A FADED BLUE WASH. THE JEANS ARE FIVE POCKET AND ZIP FLY AND HAVE A ORANGE TAB. THE JEANS HAVE THE HIP PATCH AND A UNIQUE CARE GUIDE SEWN INSIDE AND THEY ARE BOTH LEGIBLE. Made in USA, Talon 42 zip, 100% cotton raw denim. Thigh: 13". LEVI BIG E JEANS. “Cinch Back” 501s 33W X 34L. Purchased in 2002,worn a few times. Please bare in mind that these are pre-shrunk so will be about a 33”waist. Dispatched with Royal Mail 2nd class signed for. 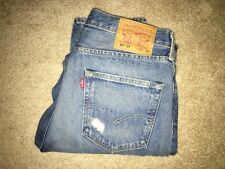 VINTAGE LEVI 501 MEN'S JEANS. 34 34. OVER 20 YEARS OLD. GOOD CONDITION. 34" WAIST 34" LENGTH. PRETTY GOOD USED CONDITION - SEE PHOTOS. Made just AFTER redlines, no selvedge seam. From the 80s I believe. Front Rise: 12". 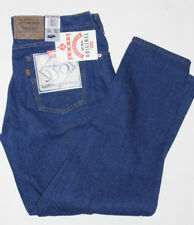 GENUINE PAIR OF US MEN’S 501 LEVI’S DENIM JEANS IN WHITE. US SIZE WAIST SIZE 31” (NOT AVAILABLE IN UK), LEG 32” FADED BUT IN GREAT CONDITION. PERFECT FOR DYING A DARK COLOUR. FROM A SMOKE FREE, PET FREE HOUSEHOLD. These were well taken care of. Color may not always be an exact reflection of the original due to lighting and the device you are viewing them on. Size: 36 x 32. FEEL CONFIDENT. 100% Cotton. Low Rise: 7 - 9.5" Rise. These were well taken care of. FIT: Loose/Wide Leg. Color may not always be an exact reflection of the original due to lighting and the device you are viewing them on. We strive to give you a clear and honest presentation of the item. Classic made in USA Orange Tab 505's. i.e. the greater the area of fabric in the photo, the closer the image is to "reality". style / model Bad Karma. very good condition. Excellent if you find the wear appealing. USA made Levi's 550's. i.e. the greater the area of fabric in the photo, the closer the image is to "reality". there is wear and fade, resulting in an appealing variation in the denim color / saturation. Button Fly D istressed 532 On Waist Button Bar Tack on Rear Pockets. 10.75 " - Front Rise (Waist to Crotch Seam). 14" - Rear Rise (Waist to Crotch Seam). 40.5" - Outseam (Waist to Hem). Very rare. We do whatever it takes to ensure you have a positive experience - Consider us your partner in fashion! THE JEANS HAVE FOUR POCKETS, A DARK RED TAB AND A ZIP FLY. THE JEANS HAVE STRAIGHT LEGS AND A LEGIBLE USE & CARE GUIDE INSIDE. THE JEANS HAVE A FADED WELL WORN LOOK TO THEM WITH A FADE ON THE THIGHS AND BACK POCKETS AS WELL AS A CREASE DOWN BOTH LEGS WERE THESE HAVE BEEN MAINTAINED BY DRY CLEANING. 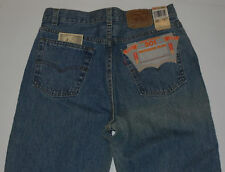 Levis® Made In The Usa 501™ Original Fit Jeans Straight Leg Button Fly W 38 L 32 ( photo from 38/34 ! ). A cultural icon. Worn by generations, defining style for decades. An iconic straight fit with the signature button fly and an authentic look and feel.